Quilt for Change has curated four challenge exhibits in conjunction with the United States Mission to the United Nations in Geneva, Switzerland. For three exhibits, we partnered with a non profit organization to set the theme and reach out to the quilting community in North America and internationally with a call for quilts on the specific theme. After the exhibits are displayed at the United Nations in Geneva, they then travel to quilt festivals across the US and other venues in Europe and North America. If you have a venue where you would like to display one of our exhibits, please contact us at quiltforchange@me.com. 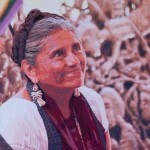 Click on the links below to view information about each exhibit and for links to our partners. To find out about future calls for entry, please follow our blog, or follow us on facebook and twitter. For excellent resources on art quilting, including Calls for Entry, articles on how to photograph your work, writing an artist statement, and how to complete an online entry form, please visit SAQA.com, the website of Studio Art Quilters Associates. 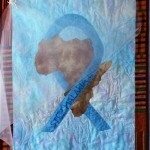 Artists were invited to create quilts that address the issue of clean water and its impact on the lives of women and girls. Jurors selected 41 pieces from artists from seven countries including the U.S., France, Italy, Canada, Switzerland, Israel, and Mexico. The exhibit was organized in partnership with the United States Mission to the U.S. Mission to the U.N. in Geneva and American Exchange Rome. “Water is Life” opened at the United Nations’ Palais des Nations in Geneva, Switzerland, in March, 2016 to commemorate UN World Water Day. The exhibit was on display in Frascati, Italy in September 2016 and will open in the United States at the Houston International Quilt Festival the first week of November before being on display at the New England Quilt Museum in Lowell, Massachusetts from February to April 2017. It will then travel with Mancuso Quilt Festivals to seven U.S. cities. Quilt for Change was part of an exhibit at the New England Quilt Museum in Lowell, MA titled “Advocacy Quilting: Inspiring Social Change.” The spring 2015 exhibit featured quilts from all three of our challenges to date as well as quilts from one of our partner organizations, The Advocacy Project. Allison Wilbur gave a brown bag lunch lecture on Charity Quilting in the U.S. on Thursday April 2, 2015 at the museum in Lowell. 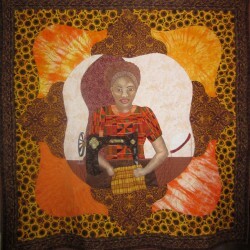 In partnership with Solar Sister, the 22 quilts in this exhibit feature energy, poverty, and the role women entrepreneurs can play in creating innovative solutions. This exhibition was organized to highlight the important work of Solar Sister, a Rhode Island-based non-profit that uses a micro-enterprise model to develop a network of small businesswomen (Solar Sisters) in Africa.The exhibit opened at the United Nations in Geneva in June 2013 and traveled in the US from 2013 – 2016. In partnership with the United Nations Population Fund (UNFPA) These 20 art quilts from the U.S., Canada and Iran are a call for solidarity to defend and protect women in times of conflict and to empower women to be active agents in peace negotiations. The exhibit opened at the United Nations in Geneva in March 2011, at the UN in New York March 2012, debuted in the American quilt world at the International Quilt Festival in Houston in November 2012, and traveled with Mancuso Quilt Festivals in 2012. It was also featured at the New England Quilt Museum and at Tufts University at the Fletcher School. In partnership with The Global Fund to Fight Aids, Tuberculosis and Malaria, the 17 quilts in this exhibit address the progress in the battle against AIDS, tuberculosis and malaria. The exhibit opened at the U.N. in Geneva in 2009, and toured with Mancuso Quilt Festivals at seven regional quilt shows across the U.S. in 2010. The exhibit was also displayed at the Machine Quilters Expo East in Providence, RI in April 2012.